It is this trivia that we hear in school - Columbus discovered America. While that statement is inaccurate on many counts, considering, the Viking explorer Leif Erikson arrived in Newfoundland around 500 years before Columbus did, and the first European explorer to first set foot in the American mainland was Amerigo Vespucci. Despite all these, Columbus did possess a lot of courage and introduced the Europeans to a whole new world and this is a short biography attempting to recollect the life and journey of Columbus. Columbus was from Genoa (present day Italy), and was from a middle class family. His brother Bartholomew was a cartographer and Columbus too was passionate about ships and the sea. It then moves on to Columbus' adult life, sailing as a business agent to various parts of Europe. Columbus always believed that there was a route to Asia through the west and believed that it wasn't too far away. However, his ambitious project didn't receive sufficient funding, and the King of Portugal was not interested in funding his expedition. Queen Isabella of Castille did respond and accepted to fund his expedition and he finally ventured past Azores, something carried out by no European in the past. It then talks about his three expeditions, his discovery of Hispaniola, Cuba, among various other islands and governing them on behalf of Castille. There were also scandals that broke out, saying Columbus was a fraud, and also on how he treated the natives and others. The book brought out the fact that the task undertaken by Columbus was very daring, because Europeans were already comfortable with the Cape of Good Hope route to Asia and were not interested in taking such a big risk. The description of his disappointments upon realising that it wasn't Asia was also brought out well, his misgovernance, treatment of slaves and in fact, the slave trade he carried out with the natives, was all described very well in the book. I felt that in an hour, this book covered the details in a manner in which you could read it all in an hour and at the same time, revisit some of Iberian history of the 15th century. 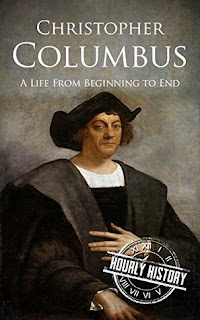 The book concluded on how Columbus should be viewed - whether as a daring explorer who opened up Europeans to a world beyond Azores or someone who ill treated the natives, indulged in slave trade and forcibly imposed his religion on them. The book left the judgement on Columbus to the individual reader. Based on my experience with it, I would award the book a rating of eight on ten.